NOTE: prior to the 1960s Deaf people did create works about the Deaf experience but their was no specific name given to this genre and no collective organizing of artists to explore and promote this expression. 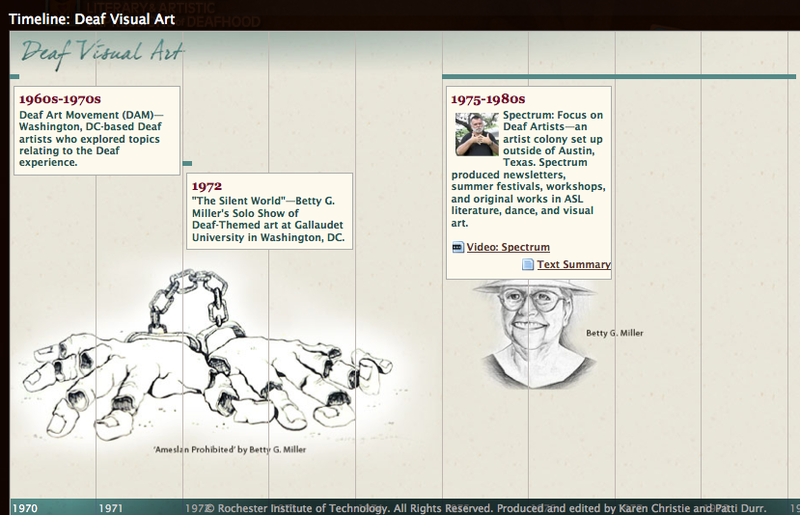 In 1972 – Dr. Betty G. Miller had a solo show entitled “The Silent World” at Gallaudet University. This is the first known exhibit of works entirely about the Deaf experience. The exhibit featured many resistance pieces, most notably “Ameslan Prohibited,” which brought the truth out about the abuses of audism and oralism and shown a light on the joys of being Deaf. 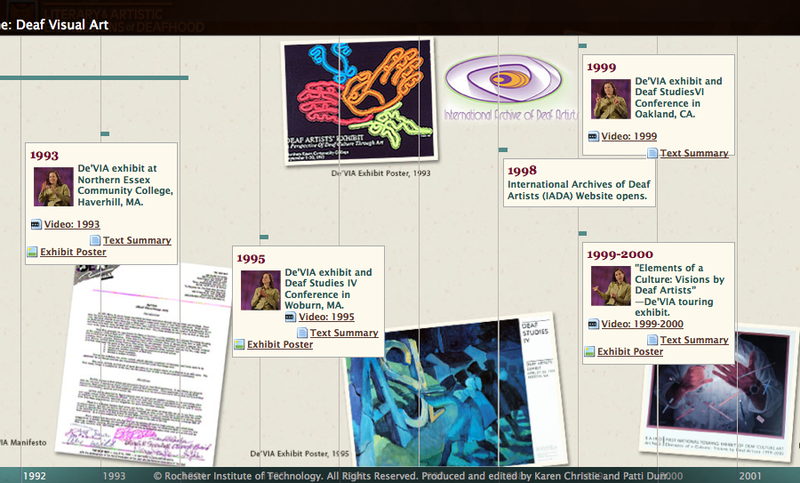 From 1985-1995 Deaf Artists of America (DAA) ran – it had a gallery space from 1988 – 1992, hosted numerous exhibits of works by Deaf artists and published a newsletter. In 1987 DAA hosted a conference at NTID where there was a discussion about art specific to the Deaf experience. 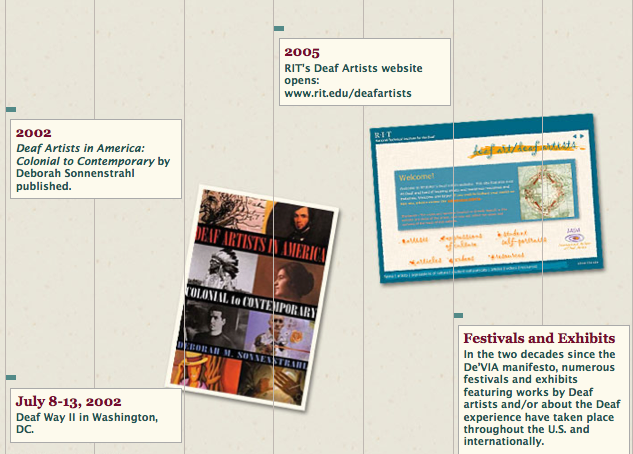 In 1998 the International Archives of Deaf Artists (IADA) website was open at RIT. In 2002 the book Deaf Artists in America: Colonial to Contemporary was published and includes information on De’VIA and several De’VIA artists as well as many non-De’VIA artists. Deaf Way II also took place in 2002 in Washington, DC and featured many international Deaf artists and had a panel discussion on Deaf View/Image Art. In the two decades since De’VIA was formed there have been numerous art festivals, conferences, publications, and exhibits covering De’VIA. There have been numerous events, festivals, booths, exhibits, and retreats honoring and expanding De’VIA in recent years. Around the same time that the Surdism Manifesto was created, US De’VIA artists began to take their works from walls into the street and engage in more and more peaceful activism via artistic expression and thus we see the 2nd wave of De’VIA ie Surdism begin and take roots and wings. The 25th anniversary of De’VIA saw many exhibits honoring its long history as well as an increase in De’VIA ARTivism and a celebration of our collective conscious. *2013 – AFA’s 1st ASL & Deaf Pride parade – Arnaud Balard’s Deaf Union flag premiers in the US. *2013 – Group of De’VIA artists went to Russia to share about De’VIA at an international exhibit of art by Deaf artists. *2014 25th anniversary of De’VIA – numerous exhibits and events celebrating (including challenges) the anniversary. there are alot more events here and there but it seems things are manifesting themselves – fastly and surely.